I love pizza. I could eat pizza every day of the year and never get tired of it. I imagine my kids feel the same way, most kids do. You can imagine the cost of that would be astronomical. Luckily for me, Big Daddy is the Dough Master. He makes a wicked pizza dough, which translates into a wicked pizza. When you consider making pizza at home, the cost analysis is frightening. You can make a large pizza for under five dollars. That is a better deal than the $12 plus that you could shell out for delivery. The biggest problem is getting the dough just right. I’ve noticed that lots of people are intimidated by dough. I don’t blame you, it’s fickle, and made with gaseous fungi (yeast). But it is so worth trying at home. 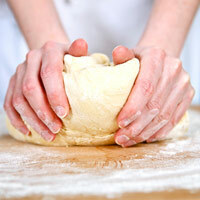 There are so many different types of pizza dough that it’s hard to recommend one for you. My only advice is to use a mixer with a dough hook to save your arms. Possibly more important is letting the dough rise enough. The more you let it rise the more flavor your dough will have. Try a long rise over night in the fridge. Or setting your oven to 200 degrees turning it off and putting your rising dough inside for 30 minutes. After that put your dough in the pan and let it rise some more. If you like pan pizzas get yourself a cast iron skillet. This will give you the crispy sides and bottom, but still the chewy goodness of the inside. Don’t have a cast iron skillet? Cake pans will work, but the crispness won’t be quite so pronounced. And the most important thing about making a pizza? Involve the kids! It tastes better when they make it.